This month has not been a kind one for my birding tendencies. It's been a series of revolving out-of-town visitors and/or house and yard projects. One of those projects that has been dragging on for awhile is a new deck. 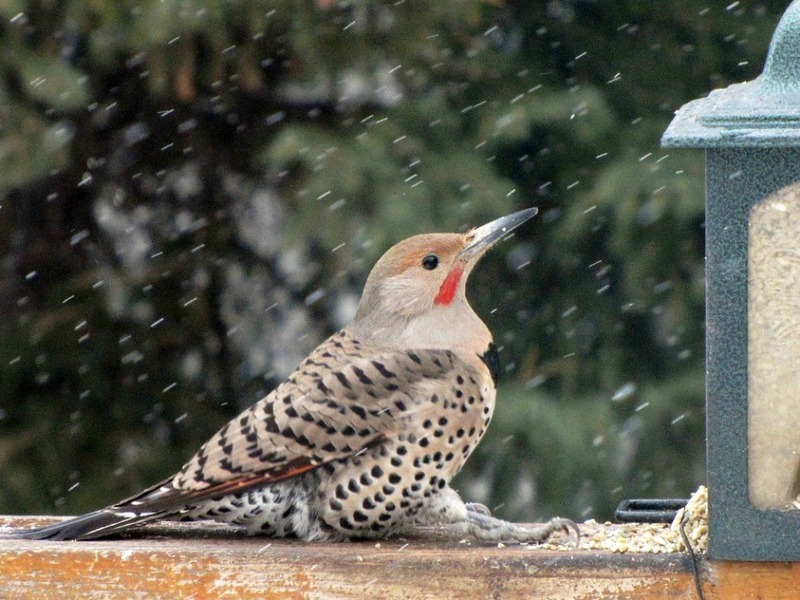 We've had a deck in our backyard for over 20 years, and it has provided a wealth of bird sightings in all seasons. With feeders fastened to the railing, it was easy to spot the visitors and quickly grab a photo. This summer, we finally reached the point where we could no longer ignore the aging structure, so we bit the bullet and decided to upgrade the bird platform. I mean deck. First the old railing came down, and the birds did a lot of mid-air fluttering when there was nothing to land on. I felt horribly guilty. As soon as I could, I set the old feeder down at deck level, which soothed some ruffled feathers. 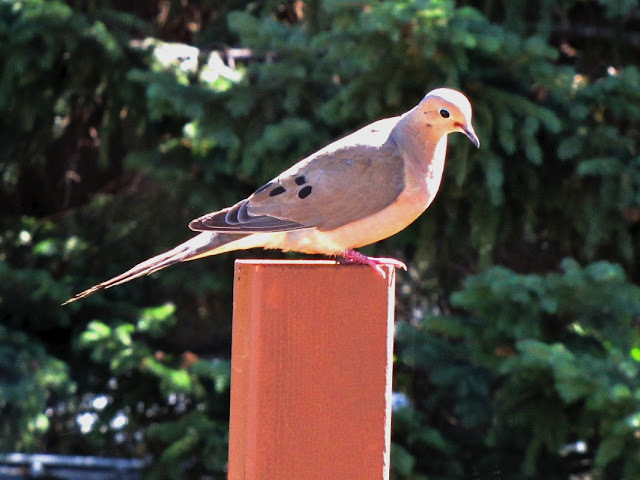 Designing and building a deck yourself is complicated enough, but trying to work around the birds added a new wrinkle. Our original plan was to use aluminum railings, but rejected that idea when we discovered they have rounded tops. 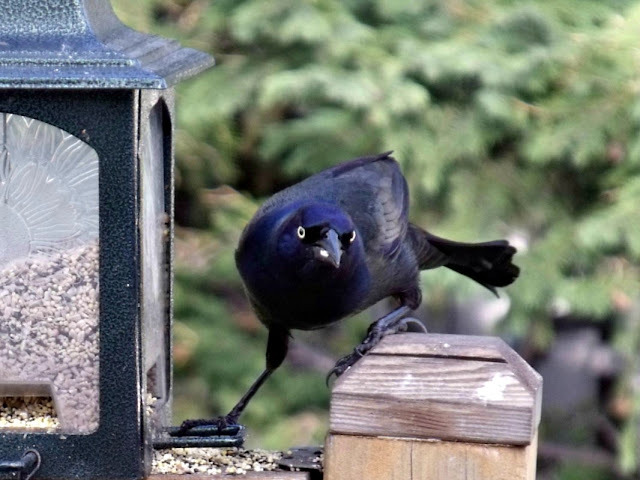 What good is a railing that won’t hold a bird feeder? After untold discussions which would have sounded ridiculous to a non-birder, we came up with a solution. 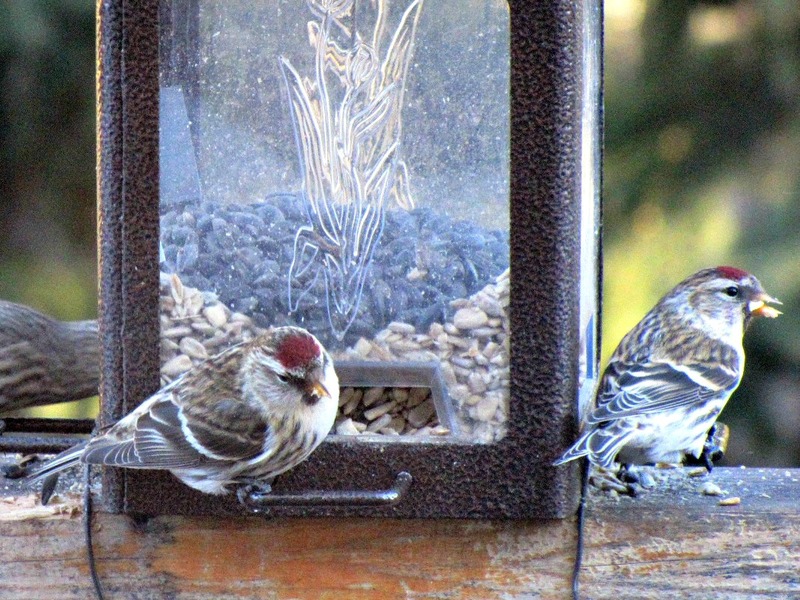 We would build a separate bird feeding shelf. The planning began all over again. What would we use for materials that birds would accept, could easily be cleaned of their droppings but wouldn’t cost a fortune? 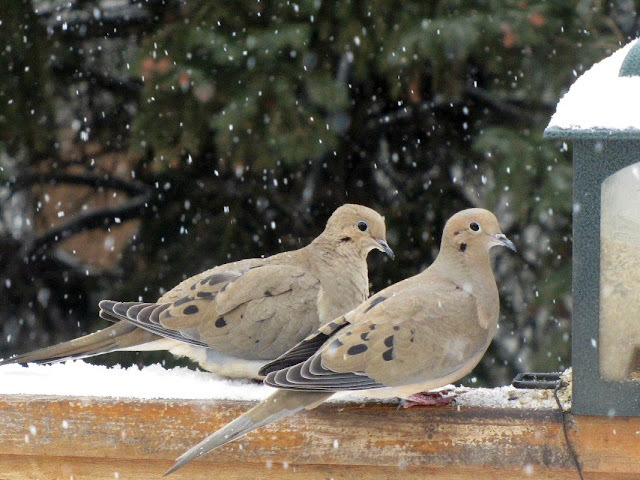 How would we feed both Mourning Doves, that need room to fly in horizontally, and woodpeckers, that fly in vertically? We are now familiar with every hardware and lumber supply store in the city. All those miles we should have put on strolling down nature trails, were instead spent clomping down long aisles looking for deck components to satisfy birds. At this point, even my bird-centric self was feeling a bit ridiculous, not to mention manipulated, by something we already spend hundreds of dollars a year on to feed. We have yet to install the railing, and the stairs still need to be rebuilt, but hey, we’ve got a bird shelf. (Skewed-Priorities-R-Us). The feeding station has lots of manoeuvring room for the doves, and plenty of space for two feeders. This isn’t to provide a variety of foods - it’s an attempt to allow the birds to eat when the rodent has planted itself at the feeder. 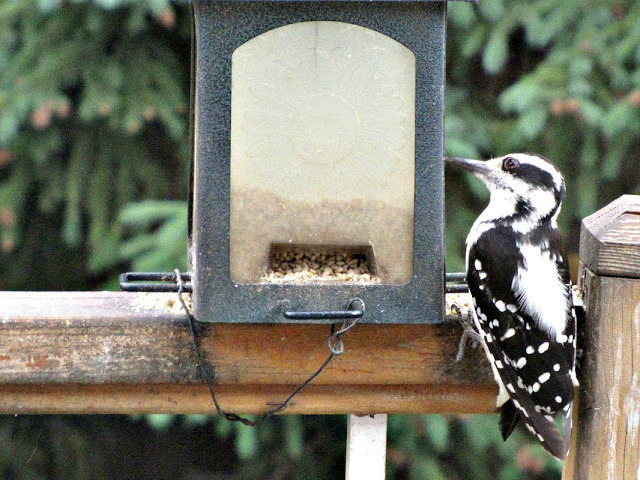 A high post that was supposed to be temporary will now become a permanent place for two suet feeders, suitable for woodpecker and nuthatch fly-ins. It apparently makes an excellent landing spot to scope out the food table as well. I was initially worried that the new shelf might be too close to the house, but I was soon proven wrong on that count. I will no longer need binos, as the birds are 9 feet from my face. Zoom lens? Pfft. The location of the new shelf means I can see the birds while (supposedly) working on the computer at the kitchen table. I’ve already decided the head-twitching has great ergonomic value. I considered and dismissed the idea of moving the computer. The eye-level twittering and flapping of birds has proven to be too much temptation for my cats. Knowing full well they aren’t allowed up there, we are working out a system of mutually ignoring each other when the feeder is busy. 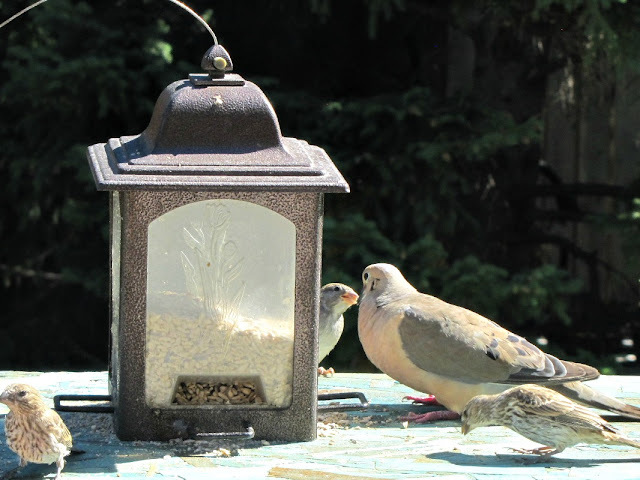 The Mourning Doves have found the new food station, although it took this one a good few minutes to figure out the changes. Once he started feeding though, he proceeded to chase away all the smaller birds. The ultimate seal of approval has come from the Black-capped chickadees that have shown no hesitation in using the new shelf, so now we can relax. Oh, and we can finish the deck. 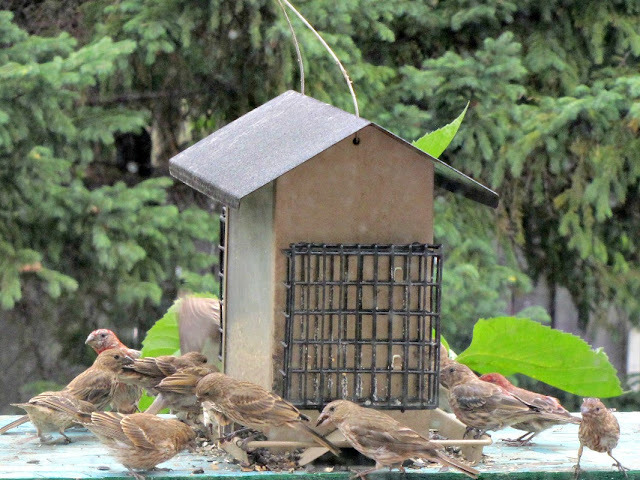 Great post Pat, glad the birds are liking the new digs. Fun post filled with wonderful photographs! We are in the process of building a home and I am already thinking about my bird deck setup, though the completion date is over a year away. You've got beautiful birds ... and a black squirrel (cool!) visiting your yard! 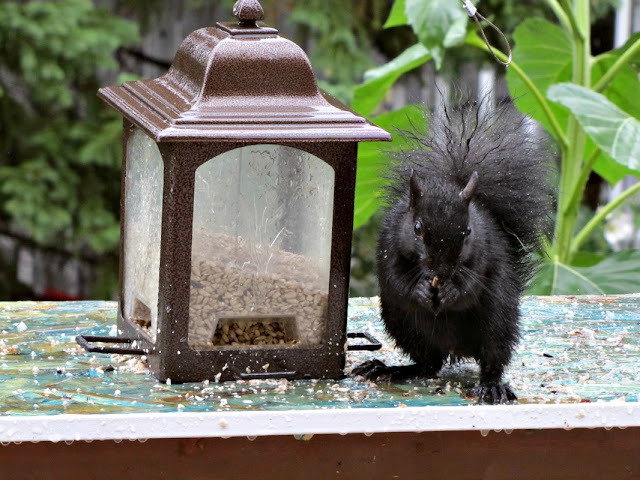 Beautiful series all the different birds, also very nice that the squirrel visiting your garden. 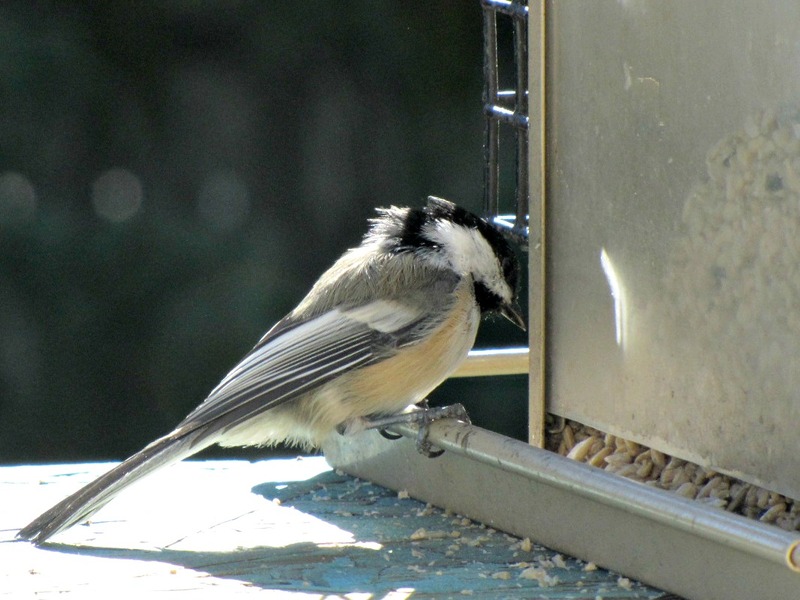 I'm happy to see that the new bird feeding platform meets with the approval of the feathered and furred residents. 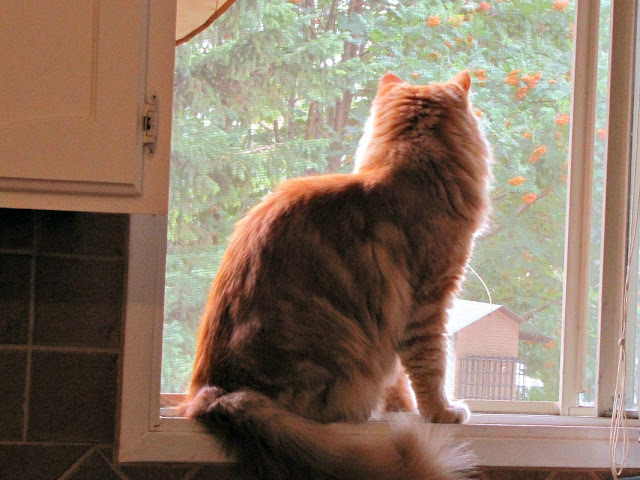 Perhaps some day the humans can enjoy it, but that's not a priority, right? What a fum post! Pat, you need a bumper snicker that says "Burd Luvrz R US!". This is a great post and you have your priorities straight. Thank you all for the great comments. The shelf is still a work in progress, but appears to be a hit so far. I'm sure they'll tell me if we need to change something! You get a lot of very nice birds. 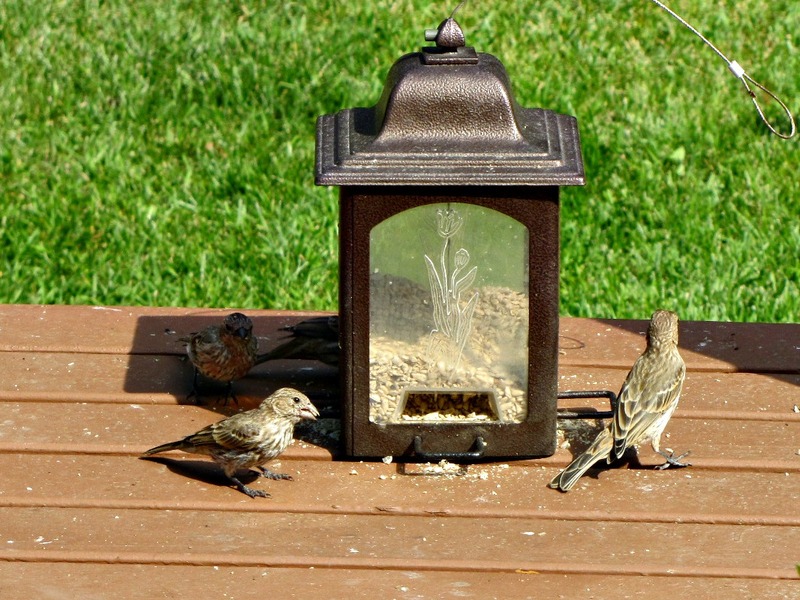 Whatbare all the small brown ones that look like our sparrows?